Dayton Callahan sticking his head into Goose Lake Meteorite at Smithsonian National Museum of Natural History. Meteorites provide a record of the chemical processes that occurred in the Solar System before life began on Earth. We are interested in the organic composition of carbonaceous meteorites as well as other extraterrestrial materials. One particular interest is nucleobases and nucleobase analogs. Nucleobases are substituted one-ring (pyrimidine) and two-ring (purine) nitrogen heterocyclic molecules that serve as the structural basis of information storage in RNA and DNA. These molecules are essential for life as we know it and may have been essential for the origin of life on Earth. We have conducted targeted analyses of nucleobases in different groups of carbonaceous chondrites, discovered new nucleobase analogs in carbonaceous chondrites, and linked these meteoritic compounds to HCN chemistry. We reported that some of the nucleobases found in meteorites are extraterrestrial in origin ending a debate that was over 50 years old (Callahan et al., PNAS, 2011). We continue these studies by developing analytical methods and techniques for the analyses of organic compounds in complex extraterrestrial materials, elucidating potential formation pathways for nucleobases and nitrogen heterocycles, and understanding how these compounds contributed towards the formation of primitive genetic polymers (Smith et al., OLEB, 2016). Biomolecular archaeology, the scientific analysis of ancient organic remains, has become invaluable towards understanding our human past and cultural evolution. 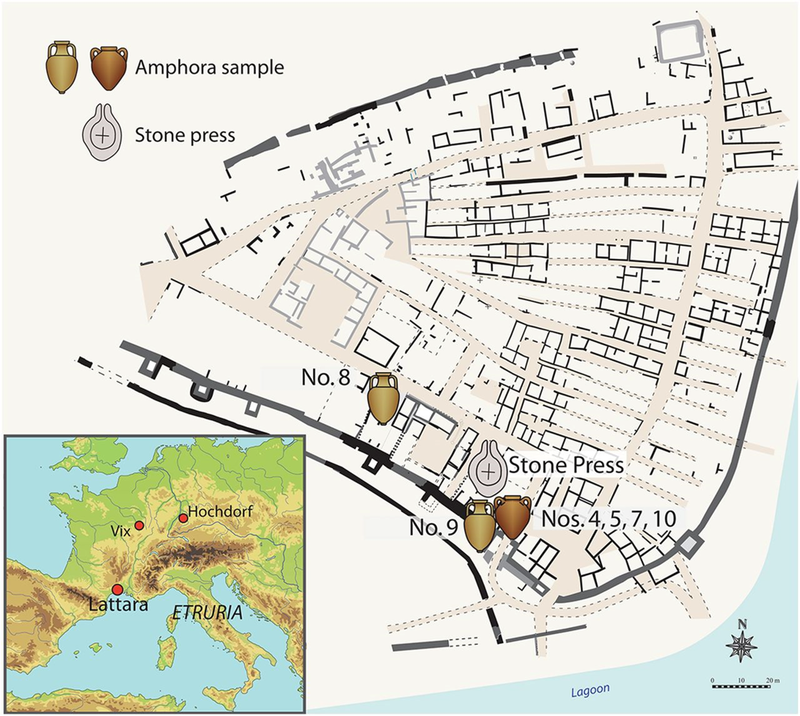 In collaboration with Dr. Patrick McGovern (University of Pennsylvania Museum of Archaeology and Anthropology), we analyzed Etruscan amphorae and a limestone press (ca. 425-400 B.C.) from the ancient coastal port site of Lattara in southern France (see map on right). We developed the critical analytical methods that unambiguously identified wine biomarkers in these samples. Direct chemical analysis along with archaeobotanical evidence and anthropological context provided the earliest proof for grape wine and viniculture from France, which is crucial to the later history of wine in Europe and the rest of the world (McGovern et al., PNAS, 2013). We also analyzed numerous early Neolithic pottery sherds (and associated soil samples) excavated from the sites Gadachrili Gora and Shulaveris-Gora in Georgia. Our chemical analysis, along with archaeobotanical evidence and climatic and environmental reconstruction, points to grape wine and viniculture from the Near East as early as ca. 6000 BC (McGovern et al., PNAS, 2017). Currently, we are developing new analytical methods for organics preserved in archaeological vessels and plan to study materials from additional Neolithic sites with Dr. Pat. We are also investigating potsherds from Askut, an ancient Egyptian island fortress on the Nile, in collaboration with Prof. Stuart Tyson Smith (University of California Santa Barbara). Algae has the potential to be a sustainable source of biomass and oils for food, animal feed, fuel, and bioproducts in addition to their utilization of nutrients from a variety of wastewaters, which can reduce costs. There is a need for high-throughput and rapid screening methods for lipids and other organics to evaluate the optimal treatment conditions for the production of oil-rich (high lipid content) algae. This need is further supported by the fact that only a fraction of algae species has been explored for the production of biofuels due to their large diversity. We are collaborating with Prof. Kevin Feris (Department of Biological Sciences, Boise State University) and his research group to investigate fatty acid composition of algae polycultures grown in dairy wastewater and how polyculture selection could influence lipid and fatty acid production (Thomas et al., Algal Research, 2019). The good news is that we work with the algal biomass right now instead of the dairy manure.